Advantages: Hundreds of photographs of superb quality; brief text is to the point; bonus information and pictures of gun truck models. 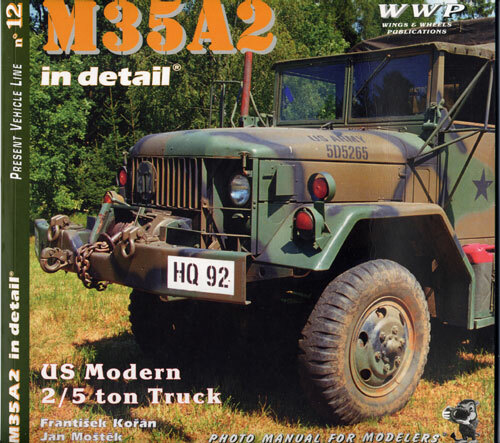 All text is in English with 72 pages and there are 289 photographs of the M35 A2 truck and the surprise in this publication is the inclusion of the Gun Truck Models there are 40 and a further surprise is the inclusion of the Quad .50 Turret Mount which has 12 photographs and 7 black and white line diagrams. Lastly, to add even more detail to this book it contains 14 high quality art side profiles of Gun Trucks in Colour. The book starts with a brief history of the vehicle and then it goes straight into the photomontage of the actual vehicles. The versions that are covered are the GS version, the House body along with the Fuel tanker, and a single Gun truck. All the the close up details are from the GS version. This covers all the details a modeller could ever want. I know by looking at many of the photographs I recognise not only the individual vehicles but the location. Having seen nearly all of them at the War and Peace Military Vehicle Rally at Belting, Kent here in the UK over the last 14 years I have attended it. The level of detail contained is truly outstanding and shows the amount of mud, dust, and grime that gets into every crevice on a vehicle. For those modellers who want to add realistic weathering to any vehicle then they cannot find a better publication to illustrate it than this. The only part that is missing from this book is the smell of canvas, fuel, grease and oil. Armed with this book you can turn any of your M35 kits into a masterpiece of modelling, it shows all the details needed to do this. This not a book for the restoration section of the military vehicle fraternity but is aimed solely for model makers. Having just taken up an interest in Gun trucks myself and starting my own research this is an invaluable book. As a bonus it has, part worked but completed models but unpainted, which show the level of details the model makers have gone to achieve the superb models. The authors are to be congratulated on this inclusion it adds depth to the subject. If I had to pick out a single photograph to illustrate the level of detail then it must be on page 48 top left it shows the underside of the vehicle, with the front axle viewed from the rear. This is weathering like you have never seen before; an absolutely outstanding photograph. From a personal point of view, it is going to be invaluable when I start my Gun truck models and it will not be sitting on the reference self for many a long day. I highly recommend it to all model makers who like to build modern US vehicles and especially those who are building Gun trucks now and in the Future. The authors are to be congratulated on adding more information to a long neglected subject of modern US Army trucks. For our American readers I give it a full ten out of ten in each category of originality of subject, quality of photographs. Check with your local book supplier for price and availability, which is not known at time of review.